Preheat oven to 350° F. Paper line 18 muffin cups. Reserve 2 tablespoons flour in small bowl and set aside. Combine remaining flour, baking powder, baking soda and salt in medium bowl. Beat butter, sugar and vanilla in large mixer bowl until creamy. Add eggs one at a time beating after each addition. Add 1/3 of flour mixture into butter mixture and mix until combined. Repeat with remaining flour and milk. 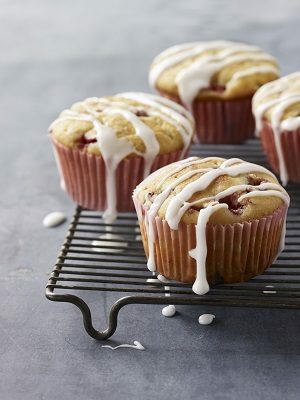 Sprinkle reserved 2 tablespoons flour on diced strawberries; fold gently into muffin batter. Spoon batter into prepared muffin cups and fill until 3/4 full. Bake for 30 to 35 minutes until edges and tops are light golden brown or until wooden pick inserted in center comes out clean. Remove and place on wire rack. Cool completely.